Indonesia has a new plan to save the Critically Endangered Sumatran tiger, reports the AFP: sell captive-born tigers as pets. The proposed price is 100,000 US dollars for a pair of Sumatran tigers with the money going to conservation efforts, though it was unclear who would manage these funds. Officials would require that the ‘pet’-owners would have to have at least 60 square meters (646 square feet) to contain the two animals. Government officials would monitor the animals’ health and punish owners for mistreatment. The AFP reports that the idea was first raised by wealthy businessmen who want to possess tigers for the ‘prestige’ it gives them. 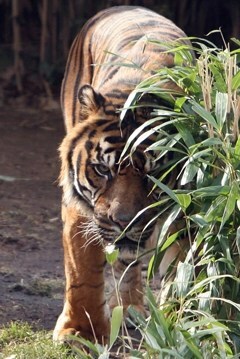 Sumatran tiger. Photo by Rhett A. Butler. However, environmentalists are skeptical. They say that instead of selling tigers as pets, the government should be focusing on conserving the dwindling tiger habitat on Sumatra. Deforestation for logging and oil palm plantations has devastated tiger habitat on the island. In addition, conservationists warn that selling captive tigers to private individuals is likely to only fuel the black-market trade in tiger parts, which has devastated tigers across their range. Tigers are the world’s largest cat; they are also the most dangerous. Even as pets they are extremely unpredictable. Long-trained tigers still attack. Working with tigers for years did not prevent Roy Horn, of the magic act Siegfried and Roy, from being nearly killed by one on-stage. The Sumatran tiger, a subspecies of the tiger, is classified as Critically Endangered by the IUCN Red List. Wild Sumatran tigers have attacked and killed a number of people in recent years as rampant deforestation in Indonesia has brought the remaining great cats, estimated at 200 animals, into closer contact with Indonesians.